The most basic prosthetic feet come in two types: Solid Ankle Cushioned Heel (SACH) and Elastic Keel configurations. These designs consist of crepe neoprene or urethane foam molded over an inner keel and shaped to resemble a human foot. Because they have no hinged parts, these basic feet are relatively inexpensive, durable and virtually maintenance-free. These feet offer cushioning and energy absorption but do not store and return the same amount of energy as dynamic-response feet. SACH and elastic keel feet are generally prescribed for amputees who do a limited amount of walking with little variation in speed. SACH Foot: The SACH is the simplest type of non-articulated foot. The name refers to a somewhat soft rubber heel wedge that mimics ankle action by compressing under load during the early part of the stance phase of walking. The keel is rigid, which provides midstance stability but little lateral movement. 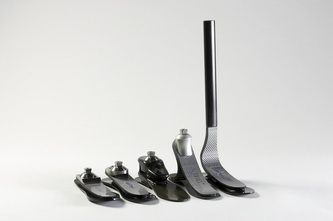 The SACH foot is available in various heel heights to match individual shoes with different heel heights. Elastic (flexible) Keel Foot: This prosthetic foot allows motion similar to that of SACH feet. In addition, the forefoot is able to conform to uneven terrain but remains supportive and stable during standing and walking. Single-Axis Foot: The articulated single axis foot contains an ankle joint that allows the foot to move up and down, enhancing knee stability. The more quickly the full sole of the foot is in contact with the ground, the more stable the prosthesis becomes. This is beneficial for users with higher levels of amputation (an amputation anywhere between the knee and hip). The wearer must actively control the prosthesis to prevent the knee from buckling, and the single-axis ankle/foot mechanism reduces the effort required to do so. Unfortunately, the single-axis ankle adds weight to the prosthesis, requires periodic servicing, and is slightly more expensive than the more basic SACH foot. A single-axis foot may be more appropriate for individuals where stability is a concern. Multi-Axis Foot: Although similar to the single-axis foot in terms of weight, durability and cost, the multi-axis foot conforms better to uneven surfaces. In addition to the up and down mobility of the single-axis foot, a multi-axis foot can also move from side to side. Since the added ankle motion absorbs some of the stresses of walking, this helps protect both the skin and the prosthesis from wear and tear. People with more active lifestyles typically prefer a more responsive foot. A dynamic-response foot is ideal for those individuals who can vary walking speed, change directions quickly or walk long distances. Dynamic-response feet store and release energy during the walking cycle by absorbing energy in the keel during the “roll-over” phase and then springing back to provide a subjective sense of push-off for the wearer. Additionally, they provide a more normal range of motion and a more symmetric gait. Some dynamic-response feet feature a split-toe design that further increases stability by mimicking the inversion/eversion movements of the human ankle and foot. The comfort and responsiveness of a dynamic-response foot can also encourage an individual to advance from a more moderate activity level to a higher activity level, given the more natural feel of walking with this type of prosthetic foot. Further, some dynamic-response feet have been shown to reduce impact forces and stress upon the sound side foot and leg. Microprocessor-controlled (MPC) feet are a fairly new category of prosthetic components. These foot/ankle components have small computer-controlled sensors that process information from both the individual’s limb and the surrounding environment to adjust to various needs. Based on information from input signals, these processors apply an algorithm, or set of rules, to make decisions about how the ankle or foot should respond in any given situation. The microprocessor provides instructions to various parts of the prosthesis in order to produce the desired function of the foot. Current MPC ankles use a variety of sensors, including ankle angle sensors, accelerometers, gyroscopes and torque sensors. The microprocessors in these systems then take the input signals and make decisions as to how to position the ankle, how to set the damping resistance in the ankle, and how to drive an ankle motor during stance phase (1). The largest potential benefit of an MPC ankle/foot system over other prosthetic feet is the enhanced ability to react to varying environmental situations by providing different mechanical properties or alignments to improve the user’s balance and mobility. For example, non-MPC prosthetic feet work nicely on smooth, level terrain; however, they have a more limited ability to alter their mechanical properties or alignment when walking on slopes or other uneven surfaces. Powered feet provide propulsion during ambulation to enhance walking capabilities in real-time. Some specific models include software as well as options for connectivity to mobile devices through smart phone or computer apps. This allows the prosthetist and user to match the performance of the ankle/foot to various activities, allow for adjustments to the input gains and timing, and turn on or off certain features. All of these functions provide a more individualized experience by the user. The ultimate goal of this class of prosthetic feet is to mimic the functions of the human foot. However, devices differ in their ability to accommodate for all environments and thus to the extent in which that accommodation can be achieved (2). Although these types of feet can coordinate the movements of the foot and ankle automatically, they do not directly communicate with the body. Microprocessor or powered prosthetic feet require batteries to power the chip, sensors, motors and actuators. Additionally, electronic parts associated with microprocessor systems make them more delicate than their passive counterparts. Many should not be used in water or in highly dusty or dirty environments. Due to the extra parts required by the addition of the microprocessor, they often weigh more than other prosthetic feet. Users may notice the mechanical clicks and sounds coming from the prosthesis as the microprocessor extrapolates information and adjusts various aspects of the ankle or foot. Finally, the higher level of technology and more intricate design of this class of prosthetic feet mean they may likely be the more expensive options on the market. Weight-activated stance-control knee. This knee is very stable and is often prescribed for a first prosthesis. When weight is placed on the prosthesis, the knee will not bend until the weight is displaced. This system functions as a constant-friction knee during leg swing but is held in extension by a braking mechanism as weight is applied during stance phase. This knee is a common choice for older or less active amputees. Ready to learn more? Contact us today for a free evaluation!